Piqo is a portable pocket-sized HD projector cube. It offers 240-inch HD projection and 200 lumens of projection power. 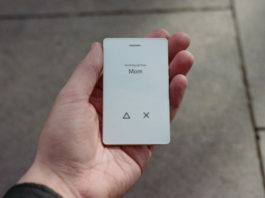 Piqo connects wirelessly or directly via HDMI or USB. 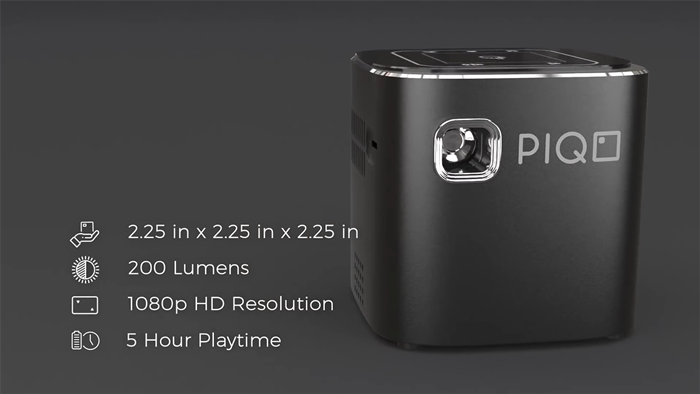 The Piqo Projector is a pocket-sized HD projector cube that enables on-the-go streaming. 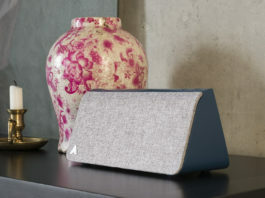 It connects wirelessly to other devices to stream and project video and TV content. But what is different about this projector that packs peak power? With features such as built-in WiFi, Bluetooth, Hi-Fi speakers, screen mirroring, offline storage, and over 50 hours of battery life, users can experience a full HD cinematic streaming from anywhere. And when you’re finished, you can stick it in your pocket. Piqo’s 200 lumens of projection power ensure cinema-quality colors and deep blacks while staying sharp at up to 240 inches. Piqo is the smallest projector in its field, measuring just over 2 inches all the way around. It was designed specifically to be the first projector that you can take anywhere with you. But high quality is not compromised with the small nature of the device. High quality colours and deep blacks deliver strong contrasts while staying sharp with its 1080p full HD projection at up to 240 inches thanks to its 200 lumens of projection power. Using Wifi or Bluetooth, Piqo can cast anything from all manner of devices onto any surface. You can access photos and videos from your phone or iPad and wirelessly cast them for all of your friends and family to enjoy. Or, control your work presentation from your phone while casting it on the wall for the office to see. Powered by Android and Google Play, Piqo Projector is compatible with over 3 million apps on the Google Play Store. However, as well as Android, the projector can also connect to Windows and iOS devices. When no internet is available, you still have access to all your media via Piqo’s internal memory. Simply download shows and movies from YouTube and Netflix for offline viewing. 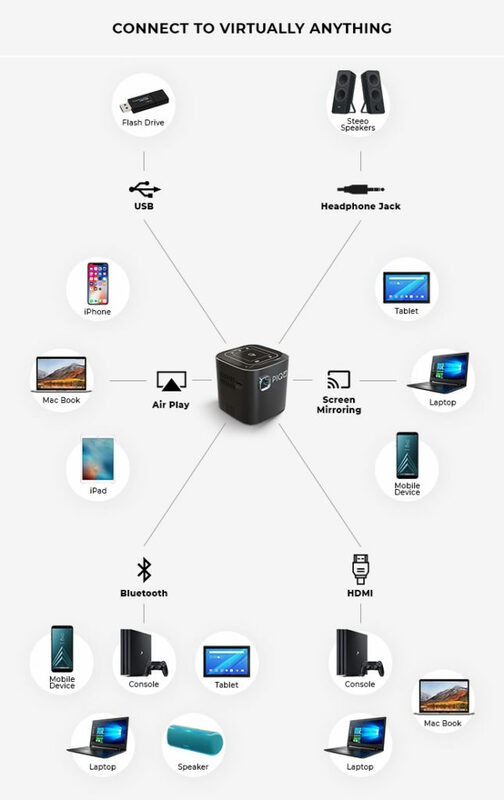 Piqo Projector can connect to a range of devices including phones and computer for work, video chatting, or creative projects. With 50 hours of music playback and 5 hours of video playtime, Piqo has a strong battery life that lets you project content without worrying about running out of charge. With just 15 minutes of charge time, Piqo offers an hour of video playback. Thanks to its smart design, Piqo fits everywhere and users can place it on all types of surfaces. 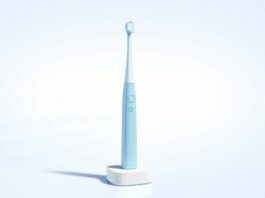 It features state-of-the-art gravity sensors that allow for automatic angle adjustments on any surface. Whether it is on a flat table, an uneven tent floor, or a lawn chair, the projector corrects its own angle with the touch of a button. Despite its small size, Piqo transforms your viewing experience in the biggest way. For ease of use, you can control Piqo with just one finger. Its touchscreen allows you to select your media, apps and more with drag-and-click simplicity. Five more touch icons around the central touch area are to control the volume, screen dimension, and navigation. Piqo’s Indiegogo campaign went live in November 2018 and has by far exceeded its funding goal.